This is essentially Deb Perelman's recipe for sweet-potato pie, streamlined for lazy cooks who, in the rush of Thanksgiving preparations, don't want to bother separating and whipping eggs. 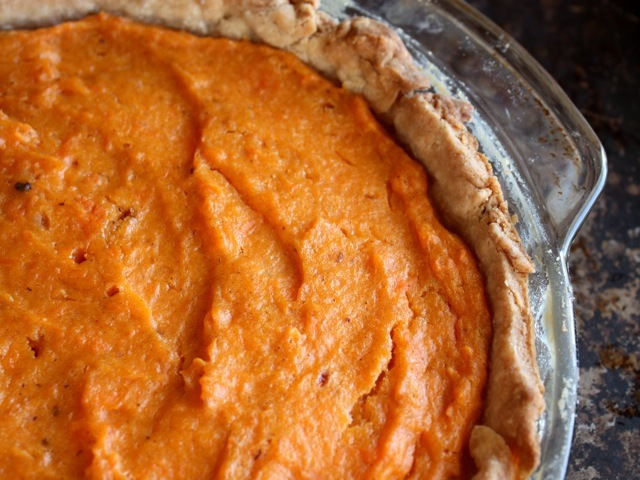 Advance planners (or cooks with little free time) can break the recipe down into stages: roasting the sweet potatoes and making and chilling the pie crust on one day, for example, then assembling and baking the pie on the next day. Preheat the oven to 375 degrees. Butter a 9-inch pie plate. Roll out the chilled pie crust and place it in the prepared pie pan. Put the sweet potatoes in a medium bowl and mash them up with a potato masher. When you've got an even, fairly smooth mash, mash in the melted butter. Add the nutmeg, cinnamon, salt, sugar, and flour, and mix thoroughly. Add the egg and mix it in with a fork. Add the buttermilk and fork it all together. Scrape the potato mixture into the pie crust and bake the pie for 45 minutes, until the crust is browned and only a few wet crumbs remain when a toothpick is inserted into the pie. Cool on a rack. If not serving warm or at room temperature, cover lightly with plastic wrap and chill in the fridge until ready to serve. When ready to serve, whip up a little cream and serve slices of pie (reheated in the oven if you like) dolloped with the cream. For the richest color and sweetest flavor, use orange sweet potatoes — the kind usually labeled "Garnet Yams" and the like — instead of pale-yellow Japanese sweet potatoes. If you're starting with raw potatoes, prick them all over with a fork, place them on a baking sheet, and roast them at 450 degrees for about 40 minutes to an hour, turning once halfway through. Let cool till cool enough to handle, then peel away and discard the skins. For a smoky, boozy touch, add a splash of whiskey or Scotch to the cream before whipping it.